Are you or your family members involved in athletics regularly or simply as a weekend warrior? 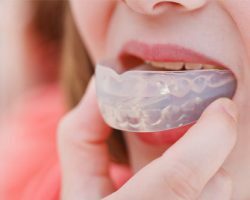 Your Midlothian, Va., general dentist has a great way to make sure you keep your smile protected: a custom mouthguard. The professionals at Biggers Family Dentistry are here to help you overcome any dental complication. We work with everyone from children to grandparents. Like any good dental office, we put a huge focus on dental preventive. We stress the need for dental cleanings and exams, preventive treatments like fluoride, and the use of mouthguards during sporting events. Dr. Biggers has spent 15 years working as the official team dentist for the Richmond Renegades hockey team. As you might imagine, he’s treated every type of dental trauma issue, but he also crafted countless custom mouthguards for the team. This makes him uniquely qualified to design mouthguards for you and your loved ones! The American Dental Association recommends wearing mouthguards during all contact sports or even sports where contact is a possibility. That covers just about every sport you can think of, from football to even weightlifting. Today we want to share a little information about how our custom mouthguards can protect your teeth. A good mouthguard will absorb the impact of blows and protect your teeth whenever you clench, which athletes do frequently. If you have children, having them wear a mouthguard protects your investment. Parents pay a pretty penny for preventive treatments and orthodontics. It would be a shame to have those investments turn into sunk cost because your child wasn’t wearing a mouthguard. Injuries to the face and mouth are more common than any other injury sustained from sporting events. Mouthguards are responsible for saving about 200,000 teeth every year in just high school and college sports. Someone who doesn’t wear a mouthguard during sporting events is 60 times more likely to damage their teeth. People in contact sports have a 33 to 56 percent chance in their lifetime of injuring their teeth or mouth. A knocked out tooth can cost about $15,000 to $20,000 over a lifetime — not to mention the trauma and pain that comes with a knocked out tooth. As you can see from those facts above, a mouthguard will greatly reduce the risk of dental injuries and save you money and heartache. We dentists can provide a mouthguard that will protect the teeth and keep the mouth looking great. Custom mouthguards can protect the teeth better than traditional boil-and-bite mouthguards. You can find a traditional boil-and-bite mouthguard in any drugstore or sporting goods store in America. These can work, but they are not uniform to your smile. A custom mouthguard is just designed for one person and perfectly fits over the teeth — you can even select any color or logo to put on the mouthguard. Plus, a custom mouthguard is stronger, fits better, and will not obstruct the airway while you’re performing. If you’re active in sports or have children who participate in sport, you need to know more about our custom mouthguards. One of our mouthguards will protect the teeth, and reduce the risk of costly, painful dental emergencies. Give us a call today at 804-977-0092 to schedule your visit.